Although being a K-9 handler is probably one of the most rewarding positions that a deputy can have at the Sheriff’s Office, it is also one that requires a lot of time and commitment. Each K-9 lives with its handler, so the responsibility of taking care of the dog doesn’t just stop when the handler ends his shift each day. The deputies have to feed, play, love and care for their dogs every day, even on their days off. 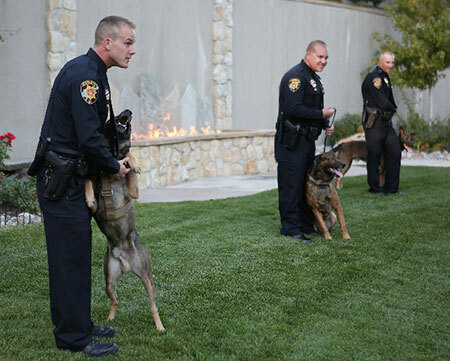 Each K-9 has a slightly different home life, but they all become a part of their handler’s family. “At home Scooter doesn’t listen, he likes to do what he wants to do, but when he gets his harness on he knows it’s time to work.” says Deputy Proulx. Being a handler requires constant training and correction of bad behavior as well as reinforcement of good behavior. When the K-9s perform well at work they are rewarded with their ball or a bite pillow. For the K-9s, going to work each day is like playing a game. “Zoos is always eager to go to work.” Tucker says. But for the handler, work is not a game. At work, the handlers need to be able to trust their dogs and know that when they need them their dog will be able to perform as he or she was trained to. This trust is built through continuous training and relationship building over time. “Having Atlas in the back seat is like always having back up if you need it.” says Deputy Morris. “It’s nice to be able to count on your partner to take care of business.” Deputy Glassburner said. Because of all the time spent together and trust built between the handler and his dog, the bond between the two is a strong one. These K-9s risk their lives to protect our deputies and our deputies rely heavily on their dog’s ability to be there for them when they need them. When a working K-9 retires, the K-9 handler is able to purchase the dog from the county for $1.00 and care for them throughout the duration of their lives. The K-9s are not just a tool that our deputies use to help them do their jobs; they are their partners.